. :: Elica Editions ::: Jean Guerin ::. One of the best-kept secrets in the very wonderful Futura Records catalogue of the late 60's / early 70's (remember Red Noise, Horde Catalytique Pour La Fin, Jacques Berrocal, Semool, Chêne Noir, Mahogany Brain and the others? ), this album even missed attaining the cult obscurity status of some of those mentioned, remaining basically unheard because of the difficulty of even getting aware of its existence, not to mention the quasi-impossibility of tracing a copy of the original LP record. It is an original and strange album as only drummers can do (remember Jacques Thollot, Robert Wyatt, Eroc, Thomas Mera Gartz, Bernard Lubat, Christian Vander? 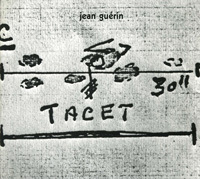 ), whose music originates from the soundtrack Jean Guérin - a rather classical drummer, at the time involved in the be bop scene in France, playing mainly in the Guy Lafitte group - composed in 1970 for Bof, anatomie d'un livreur, an anarchic feature-film by Claude Faraldo which shocked the French audience with its subversive attack against the holy trinity Work-Family-Property. Although to further differentiate here the music recorded from the film and define it as a work on its own, the title of the album was even changed to Tacet. With the instrumental contributions of Bernard Vitet and Jean Paul Rondepierre on trumpets and trumpet-in water, Philippe Maté on tenor saxophone, Françoise Achard on vocals and gloup ténor, Diéter Guévissler on double bass and himself on bass guitar, darbouka, gloup ténor, percussions, rhythm machine, generator and VCS3, Jean Guérin through many months of studio work on the elements recorded for the film soundtrack - which made this the most expensive production of the whole Futura catalogue - created an indescribable and surreal, futuristic and mysterious, liquid and spacious, echoing and sometimes grooving blend of electronics, instruments, abstract vocals and treatments unlike anything else ever recorded. A rather straight (for a change) re-issue of the original record in digi-pack type cover with 4 page insert with reproductions of the original sleeve and notes (with English translation) by Philippe Carles, co-author of the important book Free Jazz, Black Power.